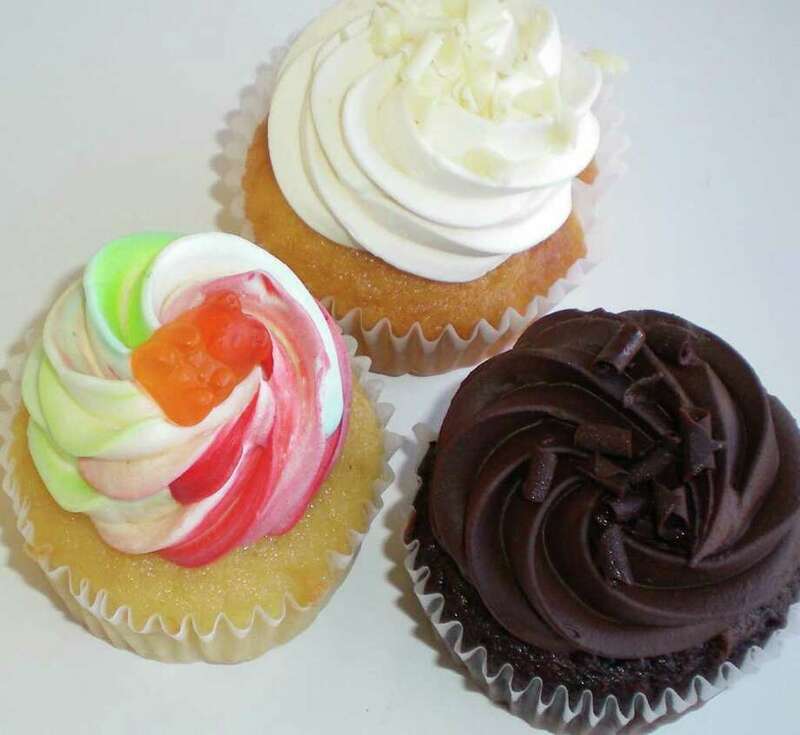 A trio of cupcake treats confected at Cake Suite in Westport. The poor cupcake. It's really getting slammed in the press these days, ever since the trendsetting powers-that-be declared that pie will be the new cupcake in 2011. Just look at the two most prominent features on the subject. There's NPR's "Cupcakes are Dead. Long Live the Pie!" and the New York Times' "Pie to Cupcake: Time's Up." How cruel. No one can deny that cupcakes have had their 15 minutes of fame. In fact, they've been in the spotlight for a good three or four years. Not bad for such a little dessert. Of course, what's not to love? They're portion-controlled (unless, of course, you get one from Crumbs Bakery, where one is probably the equivalent of four servings), they're cute and they're usually pretty reliable. Michelle Ashear Klem of Westport's Cake Suite jumped on the cupcake bandwagon about a year ago. As a pastry chef, her original focus was on custom cakes, but then she saw the demand for cupcakes. "They're now becoming something we're known for," she said. 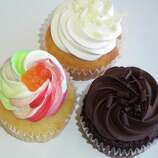 The flavors range from classics like vanilla, chocolate and red velvet, to coconut, banana and caramel. "When I read about pie being the new cupcake, I wondered if the author saw a decline in the popularity of cupcakes," said Klem. "I see the demand holding steady, and I am excited to hear about all the innovative flavor ideas popping up all over the country. Cupcakes have proven themselves to be much more than a passing trend, and I don't expect their popularity to decline as readily as they are predicting," she said. For a time, it seemed as if whoopie pie might be the dessert to take over where the cupcake leaves off. Despite the name, however, a whoopie pie has more in common with the cupcake than with pie. If you've never enjoyed this guilty pleasure, they're essentially a hand-held, cream-filled cake, popular in Maine and Pennsylvania. In any case, there's certainly been a surge in their popularity, but in the end, they lack the glamour and personality of a cupcake. So enter the pie. At its best, pie with a flaky crust and juicy fruit filling is, for many people, the ultimate dessert. Pies can be baked or fried, huge or tiny. They can be filled with fruit, cream or chocolate and can be served hot or cold, plain or ala mode. No doubt about it, pie is a versatile and universally loved dessert. Lolly Turner of Ridgefield is ready and waiting for the pie revolution to make grand in-roads. Owner of the Whistle Stop Bakery in Ridgefield, Turner sells her handmade pies every Thursday at the Westport Farmer's Market. Asked how she feels about the 2011 pie prediction, she said, "I love it!" All of her pies are made from scratch and include savory varieties (chicken pot pie, ham and cheese quiche), as well as sweet. "We're going to start making small, individual-sized pies," she said. Her most popular flavor? "You can't go wrong with apple," she said. Adam Malinowski of Adam's Bakery in Fairfield says his two top-selling pie flavors are apple and cherry, but doesn't foresee pies cutting into cupcake sales. "They're not the same," he said. "People like different stuff." So will the classic American pie put the smackdown on the humble, yet lovable cupcake? Only time will tell. "I do believe that the ground is fertile for inventive new concepts in pie, or in doughnuts, for that matter," Klem said. "I predict that pie will take a seat next to cupcakes, rather than replace them. The movement nowadays is comfort food with a twist, and I enjoy being part of it!" Of course, there is always the possibility of a compromise, as evidenced in the Cherpumple, a train-wreck of a dessert created by Los Angeles resident Charles Phoenix recently reported on in The Wall Street Journal. It's been compared to a turducken, only in this case, instead of a chicken inside of a duck inside of a turkey, you have a three-layer cake with an entire pie baked into each layer: a cherry pie inside a white cake, a pumpkin pie inside a yellow cake and an apple pie inside a spice cake, all stacked and sealed with a layer of cream cheese frosting. I suppose it's only a matter of time before there's a hand-held, cupcake version. CuPieCake, anyone?